Today is November 11, 2015. It is Veteran's Day. I have blogged about my dad many times and his service in World War II. I will post the links below to the blogs I wrote about him. We were very proud of all he did and near the end of his life, he was very proud as well. 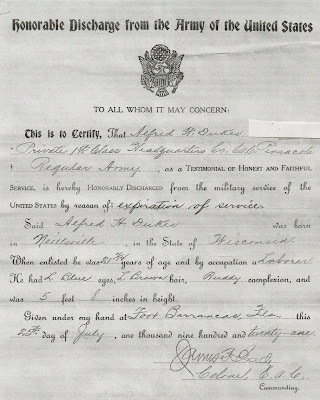 What I didn't realize is that my grandpa (Dad's father) enlisted in the National Guard of the United States and of the State of Wisconsin on November 24, 1919. 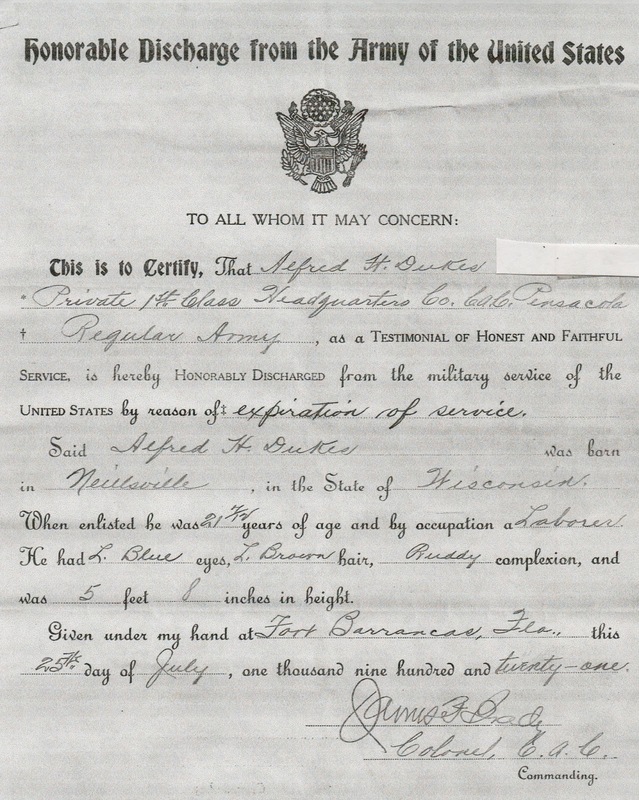 He enlisted ten days before his 18th birthday. Mixed in with my parents papers, I found some odds and ends. 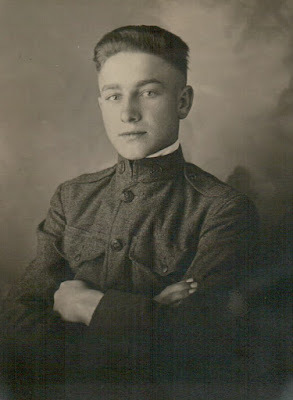 It appears my grandpa, while in the National Guard, enlisted in the regular Army in July of 1920 and was honorably discharged one year later in 1921. They spelled his name wrong and he signed it with "Dukes" instead of "Dux". I'm not sure why except that it is always mispronounced, and he probably wasn't going to correct his military superiors. Discharge Paper from the Army for my grandpa. I also found some documents stating he went back into the guard until May of 1924. He was married at that time and either left because of family commitments or because there were rules against such thing. Maybe someone in the family knows the story or knows more about Wisconsin military history from 1919 to 1924. Teachers in the early days couldn't be married, maybe National Guard members couldn't either, I just don't know. There are so many questions that could have been asked of him, but I'm not sure who even knew of his military service. All we can do now is thank him for his service ninety six years after he enlisted. Here are the links about my dad service. I didn't realize I wrote so many.